When my mother puts on make-up, she says she is putting on her face. I usually find it easier just to go with whatever face I happen to wake up in, but sometimes that doesn’t feel quite … enough. So when I was packing for the road trip Himself and I are currently enjoying, I crammed my supply of face paint into a small bag and shoved it into my suitcase. Day 2 found us rolling into Reno just barely in time for the start of the Hubbit’s 50th school reunion festivities. Getting there was good – a leisurely two days with an overnight stop at a comfortable Best Western. And while Nevada appears to be mainly a whole helluva lot of not a whole helluva lot, it has a certain stark visual appeal. Arriving was a whole other matter. Tell this South African girl she’s staying at a “resort”, and she expects to see trees, grass, some chalets scattered around a rustic but luxurious lodge, a pool, maybe a miniature golf course – you get the idea. Quite apart from the fact that it hadn’t occurred to me that we were going to a casino (yeah, I know, call me stupid) the word “resort” had me expecting some sort of desert oasis. The reality of a high rise city center hotel, with a crowded lobby that was all marble and mirrors leading to bleak little rooms failed to enchant. 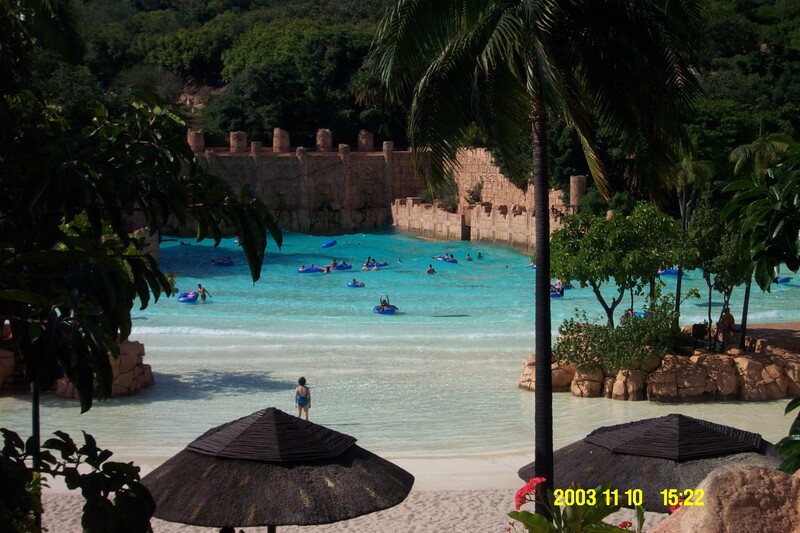 This is how we do casino resorts in South Africa. As for the casino, it was creepy and depressing. A (presumably fake but I think full scale) mine headgear loomed in the gloomy arch of the domed ceiling. Arrayed around it were machines lit in lurid colors, silently waiting to swallow your money – and, with it, your hopes and dreams – but the alleys between the machines were dark. The hotel surrounding the gambling area was loud with voices and piped music, but the casino seemed clouded in a dull hush. It used to be fun to play the fruit machines – you carried your money in a paper cup and fumbled it out to push it into the coin slot, and after a while your arm would ache from pulling the lever, but you kept pulling because the sound of money clattering into the catch tray when you won was so seductive you had to keep trying for more, until you were left with nothing but the stink of money on your hands, and an empty cup, and sleepy daydreams of what might have been if you’d stopped just 15 minutes sooner. But now it’s all done with smart cards and buttons. Bells don’t ring, lights don’t flash, and winnings don’t clatter. I don’t know why anyone would bother. So anyway, we checked in with just minutes to spare, and the Hubbit was all antsy to get upstairs to reconnect with the Good Old Days Of Yore, and I was rattled and discombobulated by finding myself in a crowded and alien world. I yanked my make-up bag (actually it’s a small linen bag that pillowcases came in and that I kept because I was sure it would come in handy some day – I don’t actually own a make-up bag) out of my suitcase, peered into the mirror, thought “Stuff it”, splashed cold water on my face, and followed Himself up to the hospitality suite. 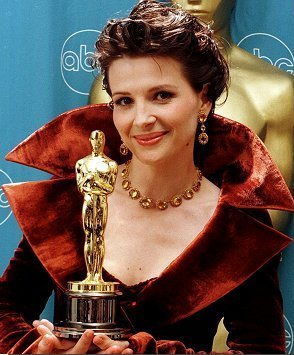 Apparently I don’t remind anyone of Juliette Binoche. she clearly had no idea who I was and no memory of ever having met me, she informed me that I did indeed look familiar because I reminded her of an actress, only she couldn’t remember which one. I snaffled a bottle of water and snuck away into a corner. People introduced themselves and told me where they were from and asked me where I was from, and at intervals Bob’s wife wandered past and said she was still trying to remember which actress it was, but my smile definitely reminded her of someone. Eventually everyone decided to go out to dinner together, and as we were leaving Bob’s wife found me again and apologized, because she’d realized I didn’t remind her of an actress, but rather of one of Bob’s cousins, who was a very sweet woman. The next evening was The First Dinner (the one on Tuesday didn’t count because it was spontaneous). I blinged up a bit, peered into my makeup bag, and said “Stuff it” again. Earrings and a malachite bead necklace was as far as I felt able to go. And it was just fine, because no one was paying attention to me while Himself got royally roasted (two bottles of “viagra” – Bob’s wife told me she had to eat her way through a terrifyingly large number of M&Ms to find enough blue ones – and a gift certificate for a Happy Ending, whatever that might be – pretty much what I expected after telling one of the Hubbit’s peers to “be as juvenile as you like” in celebrating his birthday). Last night was the Big Event. We have left Reno and are now in Vallejo, and last night’s banquet was hosted by an Admiral, no less. (The Hubbit is a Cal Maritime Academy boy.) Getting myself ready, I blinged to the max, and dumped my supply of warpaint on the sink counter. Now to give some background to all this … My friend Wonder Woman decided, for my birthday in February, to make a woman of me, and she took me shopping for Face Stuff. Ignoring my mutters, winces and rolling eyes, she selected some kind of tinted face cream (for covering wrinkled and freckles), face powder (for covering the cream), eyebrow pencil (for revealing brows that might have vanished under a layer of cream and powder), brown eye shadow, and lipstick. And I used it faithfully every day for weeks, right up until Argos ate my lipstick and I ran out of tinted face cream. Well, as part of preparing for this road trip, I betook myself to Walgreens and replenished my supply. I couldn’t remember what she’d bought, but how hard could it be to buy lipstick and face cream? Yeah … maybe I need to put more work into this process… It turns out that Jergens Natural Glow is not so much a tinted moisturizer as a fake tanning lotion. I’d already covered my face before it occurred to me to read the directions. Then I hastily scrubbed it off … slathered on cold cream that I got at the Dollar Store … patted powder over that … touched up eyelids (brown), eyebrows (browner), and lipstick (brownish). I have no idea how it turned out, because I suspect that when I look in the mirror I don’t see what the rest of the world sees – and the Hubbit is no help, since he doesn’t ever comment on my appearance and, for all I know, doesn’t notice whether I look like a clown or a queen.